In the film Do The Right Thing, Ossie Davis’ character ‘Da Mayor’ answers a cop’s question with “those who know, don’t tell. 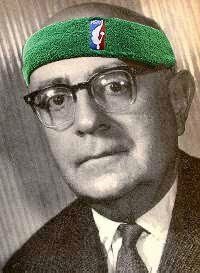 Those who tell, don’t know.” So it is in basketball, where there is no shortage of writers, pundits, and bloggers with little-to-no basketball expertise who are offering up their opinions. All the while, lurking in the shadows of the league, there are oddsmakers and the handicappers who try to outsmart them, hoarding an understanding of the game that rivals most NBA front-offices. Haralabos Voulgaris is among them. He makes his living outsmarting oddsmakers. And his is a very comfortable living, indeed. One of a small handful of people who turns a large yearly profit betting solely on the NBA, Voulgaris is known to move the lines with his action, which can sometimes be as high as $80,000 a game. He has built up a network of employees, a database of statistics, and predictive models that far surpass what many NBA franchises have available to them. And aside from a small break he took from gambling a few years ago to try to land a job with a team, he has earned his living this way for over 15 years. Haralabos knows. And while he isn’t telling, he is talking. He spoke to me on the eve of the playoffs. He wouldn't tell me who he was betting on, but he had plenty to say about basketball, gambling, and life. The distinction, he points out, is crucial. “A lot of times I felt as though a team would have success in a given matchup because they could exploit X, Y, or Z only to watch a team do something completely different. I started having a lot more success when I started focusing on what a team would do and how that would work instead of what they should do.” This, as it turns out, is the basic point behind predicitive modeling. His success has led some front office personnel to seek out his advice on the down-low. He started consulting with some people who had contracts with teams. He told Pokercast “I was a resource they were looking to mine. There wasn’t interest in having me long term. It was just ‘let’s get as much out of this guy in as short of time as possible.” Everything had to be pretty hush-hush, though. Gambling was still taboo in the NBA. A gambler of Voulgaris’ stature was radioactive to the pristine and wholesome image the NBA was trying to concoct. If he were to give up gambling, though, people in the know were telling him that his lifelong dream, becoming an NBA General Manger, may not be so far-fetched. In the end, however, it wasn’t meant to be. “I’ve been a gambler my entire adult life. I missed it.” He returned to gambling this season after a two-year absence. His experience working with the NBA suits was underwhelming. The world of NBA executives is a network of former players and coaches, people who came up through the ranks and "paid their dues." Far from a meritocracy, often the pecking order in the NBA's front offices has more to do with who you know than what you know. And Voulgaris, being a confident person with strong opinions and little patience, had a hard time fitting in and getting his voice heard. His opinions were just that to basketball executives, merely his opinions. The work was all so subjective. This wasn’t so in the world of the professional gambler. “There is something inherently rewarding in knowing on a night to night, week to week basis that you were ‘right.’ Profit and loss is the ultimate way of keeping score, and I really missed the concrete right and wrong feedback that you get when you risk your money on an opinion. When you are risking real money on your opinion, you are stripped of delusion. Voulgaris may disagree with Brown’s strategy, but has some admiration for the gumption. For as much as Haralabos champions opinions that are backed by results, he has an equal appreciation for going against the grain of common wisdom when you think you’re on to something. Common wisdom, in his opinion, is often at odds with risk-taking and as such is often an obstacle to successful strategic adaptations. “I think a lot of coaches make decisions based on trying to keep their jobs." There might be an optimal way to play a game that allows for a higher win percentage but a larger margin of defeat when you lose, he explains. Most coaches will decide they’d rather win less often if it means that when they lose they are getting blown out less often, too. Click here to read more Negative Dunkalectics. "regressive predictive modeling" tag! Great interview. nice read ! Always entertaining and informative. This is a really really great piece. Very nice job. This is a key characteristic of all great traders, whether they are trading futures, stocks, or NBA Totals. Yes. Definitely a great start/ reality check to start off this piece; which is the way u should read it. Cast aside assumptions and emotions...be entertained...but most of all LEARN.